A new resource series from the National Science Foundation is now available in the NCLOR. This series initially includes two video collections of the Science of NFL Football® and the Science of Speed (NASCAR)®. These video series explores the science behind two of America’s most popular sporting events. Summary: NBC News’ educational arm, NBC Learn, has teamed up with NSF and the National Football League® to release the “Science of NFL Football®”–an informative 10-part video series that explores the science behind America’s most beloved sport. Accessibility: Closed Captioned Instructional Materials: Lesson Plan available for each episode. In the Math Open Reference resource series, you will find geometry resources that include interactive animations explaining a variety of geometry topics. The goal of Math Open Reference is to provide high-quality math content free of charge to the end user, and provide numerous benefits over paper textbooks. Some of the geometry topics included in this series are angles, parallel lines, triangles and quadrilaterals. 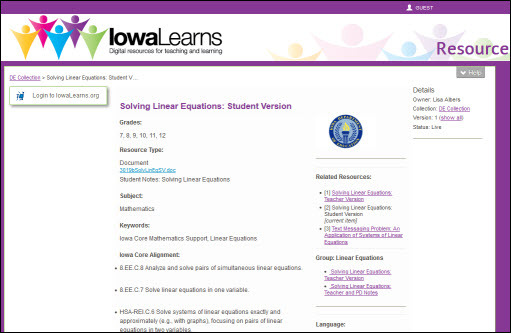 click on the Math Open Reference series.